Poster’s Note: A post from mid-May of this year never made it to the website. Posting now for the 2016 observing record. The real-time global observatory that is the internet has made available to everyone, all the time, every particular astronomical event that occurs anywhere. That said, it’s always more fun to be able to turn the computer off and point a telescope to the sky to see something with your own eyes. Our side of the planet was treated to one of the great joys of terrestrial observing – a transit of an interior (to us, anyway) planet across the face of our closest star, the Sun. The downtown Syacuse crowd for the Venus Transit in 2012 peaked at close to 350 people (far larger than the 2006 transit crowd of 10!) and was one of the best documented astronomical events in CNY thanks to local news reporters. 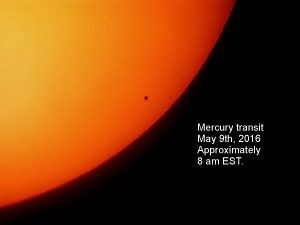 The Transit of Mercury this past Monday, May 10th was comfortably smaller, perhaps proportional to the significantly smaller black spot that Mercury makes as it passes across the Sun. A wealth of access to internet and space science resources, however, has left some excellent lasting records of the event for us to enjoy (such as the picture at right, courtesy of Bob Piekiel. Click for a larger view). With the usual thanks to Glenn Coin at syracuse.com for promoting astronomy events here in CNY (and for taking the pic at right of Bob in action, click for a larger view), local folks were made aware of the Syracuse and neighboring sessions (see syracuse.com link). Schenectady, Hamburg, Rochester, Binghamton (thanks to our friends at Kopernik Observatory), and Marcellus (thanks to Bob Piekiel) were all on the docket. Those stuck at the office were made aware of viewing opportunities online thanks to an Associated Press post at syracuse.com as well (see syracuse.com link). Chris [Schuck, fellow CNYO-er] and I kept them busy at the transit program this morning. Lots of folks mulling around with questions, cell phone cameras, and non-stop desires to see the view every few minutes. Skies were near perfect, with only a few clouds. Also, got some nice views of Venus, only 8° from the sun. Venus is so far away it is only 11 arc-seconds in size, compared to Mercury’s 10 arc-seconds. They both look about the same size in the scope, but one is white, the other was black! Freshly displaced to Rochester, I enjoyed the start of the transit from Farash Observatory, home of the Astronomy Section of the Rochester Academy of Sciences. A panorama of Farash Observatory (and deformed Coronado). Click for a larger view. 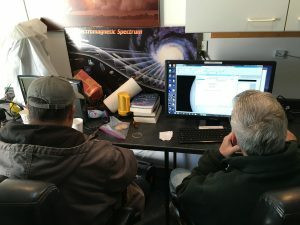 I arrived at Farash Observatory with my Coronado PST in tow (in a small plastic box, that is) around 7:00 a.m. in time to set up, chit-chat with two Dave’s (manning the live stream in the image at right), Doug, and Bob, and catch the very start of the transit (by dumb luck at that. I started observing a minute before just to get things lined up and zoomed in). All were thrilled to see Mercury begin to transit at the same point that a bright prominence had grown (I overheard someone say “looks like Mercury’s got a tail”). ASRAS provided live streaming of the event on youtube through a CaK on the Farash grounds, then the dozen-or-so folks there early cycled through everyone else’s scopes for varying H-alpha and white light views of the transit. The transit through a solar-safe 16” Cave is quite impressive(! 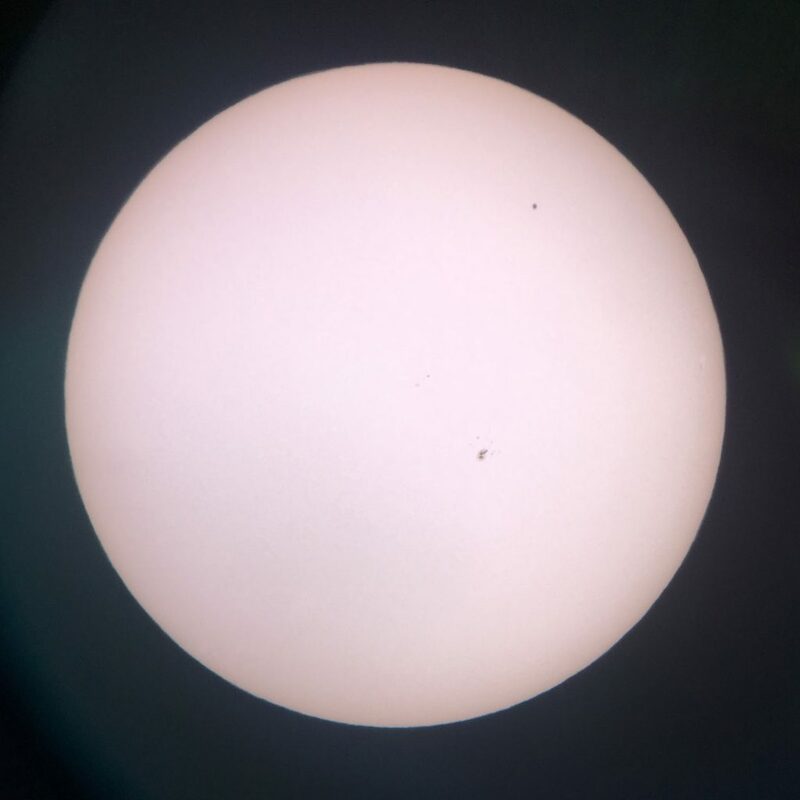 ), with Sunspot 2542 visible below Mercury (below in the eyepiece and the flipped-around view the Newtonian scopes provide). Once home, I did what the majority of us were doing – checking NASA streams and the local club feeds for more sights until the transit’s end at about 2:42 p.m.
My own poor attempt at astrophotography (with an iPhone 6s and through the ASRAS 16″ Cave) is shown below, including a slightly smudged Mercury at upper right and Sunspot 2542 at lower right. For proper orientation, see the official NASA SOHO image of the Sun at its image repository (link here). A few others with a bit more patience (and a bit more money) really made the transit memorable with some fantastic movies. One .gif passed around on Facebook is shown at right from Tom Polakis using a Lunt 100 (click for a larger view) that shows the tail end of the transit. This is the kind of stuff amateurs can do from their backyard with a good scope and a decent camera (wait for the 4.2 MB .gif to load. It is definitely worth it)! On the other hand, those with a much larger budget can put telescopes into space and produce the following video – courtesy of NASA’s Solar Dynamics Observatory (SDO). Collective thanks to all for their tax dollars in bringing images like this to the masses. 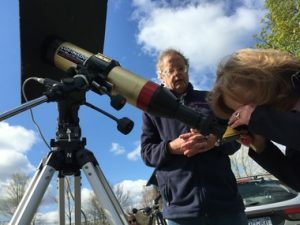 For those interested in taking in a more unobstructed view of the Sun, the next scheduled solar observing sessions in the Syracuse area are also being provided courtesy of Bob Piekiel and his considerable solar scope collection. The first is August 13/14 (Sat/Sun) at Clark Reservation, then August 27/28 (Sat/Sun) at Baltimore Woods. 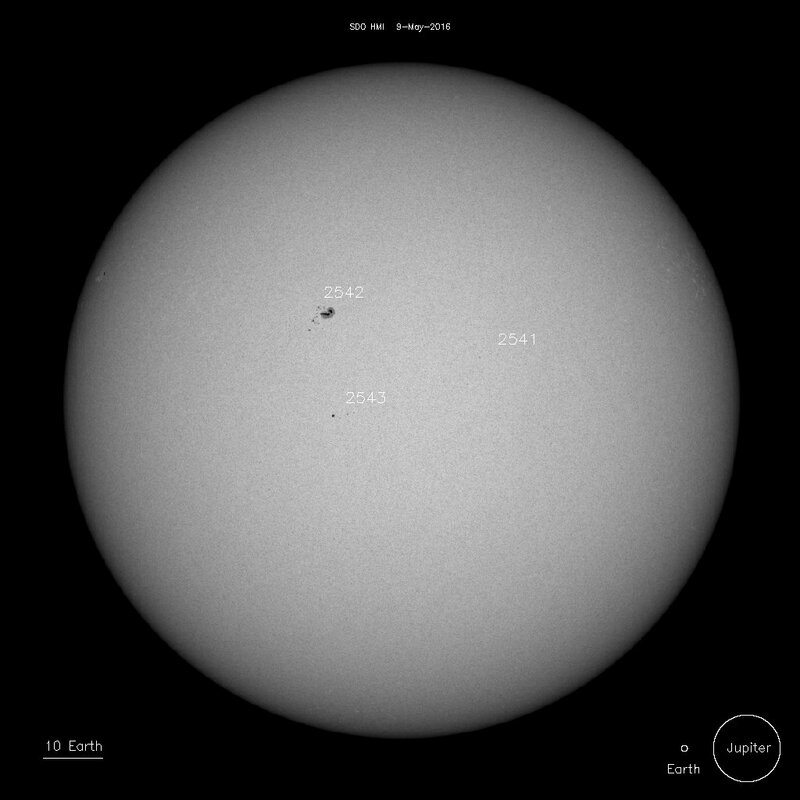 We hope you don’t wait until another transit to take in some proper solar viewing!